The 88 you guys cut up looked nicer than the one I drive. How many Fieros have been sacrificed in this build? But seriously the Fiero is not a rare car like some people would like to believe. I can buy rust free Fiero’s all day long in Texas for as little as $100 bucks for a parts car. My brother just picked up a rust free 87 SE for $250 that runs. 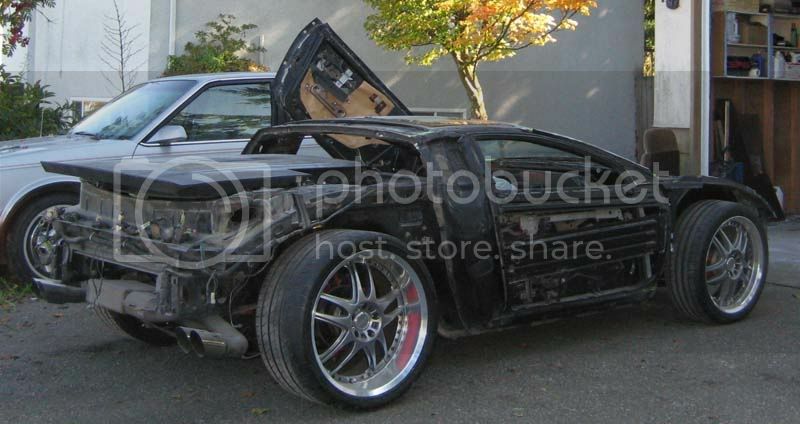 If I had a dollar for every time I read a post or a craigslist ad with rare Fiero in it I could buy 10,000 Fiero’s. That is definitely a good idea. Awesome work! So the headlights will stay in place when the hood is tilted? Agreed. I know of 1 that I see on a bi-monthly basis in the area. JUST AMAZING...can't wait to see her completed! I am looking at your headlight mounts and I keep thinking that you may want to revisit hard mounting the lights to the frame... I keep thinking you will get some shaking if they stay mounted to the front lid. The body will flex and shake as you drive so the lights may end up being unsteady. The other way if you keep the lights on the hood is to put some rubber stops on the frame so that when the lid closes, your lights will come up hard against the rubber stops to minimize the shake. Keep up the great work and looking forward to seeing more progress. Hope the rain hasn't been hitting you as hard as it has been these past few days over in Victoria. 100 km/h winds and rain here over the weekend. I think the only way you will get the lights to work attached to the hood is to have them under slight tension when the hood closes. I.E. have a tab on the car frame that the lights rest on when the hood is closed. Make that resting point adjustable so when you close the hood the lights will get pressed firmly onto that tab with a bit of tension. By doing that, you will be able to keep the lights as part of the hood, but they will be vibration free when the hood is closed. As opposed to them hanging in space off of the side of the hood and bouncing more than a street walker at Main and Hastings. Car is looking awesome, am going to try to make it back to BC to catch at least one meeting before the year is over. Ya know I had a hard enough time driving your chopper before you chopped it again. I don't think I'll even be able to sit in your car. Is yours lower than Clynts? Clynts was actually too low for me. I had to sit with my back slouched over and my head cocked sideways. Regardless of that, your car is looking amazing/stunning. I wish I could find em like that out here in San Diego! Maybe I should move to Texas. No smog, cheap cost of living and Fiero's. Lots of them all over the place. 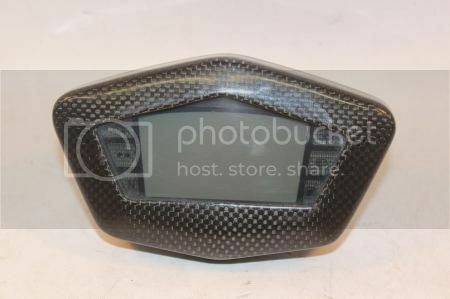 Car-lo...have you considered one of Amida's G1 interiors...say black with orange stitching if you go with that color? 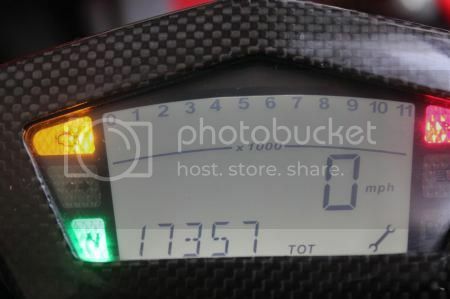 Dash from a Ducati Hypermotard 1100 would compliment the rest of the build. 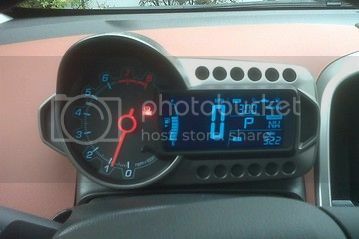 You can always try the Dash Pod from a Chevy Sonic. Car is looking great.... Keep the pics flowing! Also, I love the Caddy Light in the rear. Excellent addition. RBS2 is mutating faster than the sea-life around Fukushima. It's too bad you had to chop up the decklid on account of a light fixture. But them's the breaks, I guess. This car is awesome! 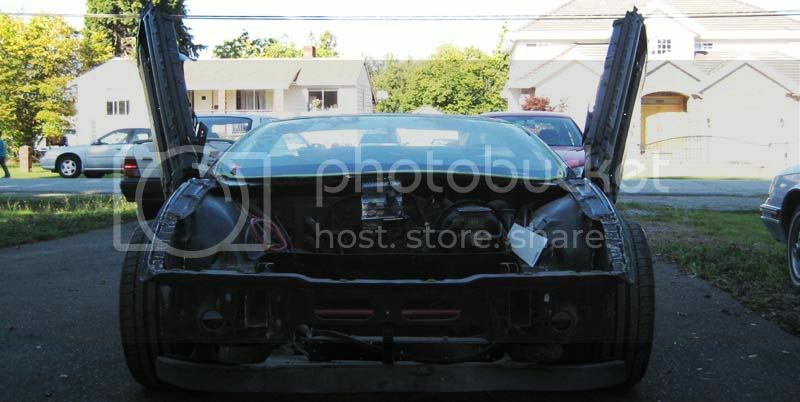 But with everything so modified and exotic looking, are you going to change the two black decklid vents? They are starting to look pretty plain compared to the rest of the car. Sorry, if you already answered this! I can't wait to see how everything turns out! Those last shots are awesome Car-Lo! One thing that sticks out as stock to me is the decklid vents though, any plans to tweak them at all? Keep up the great work Car-Lo! 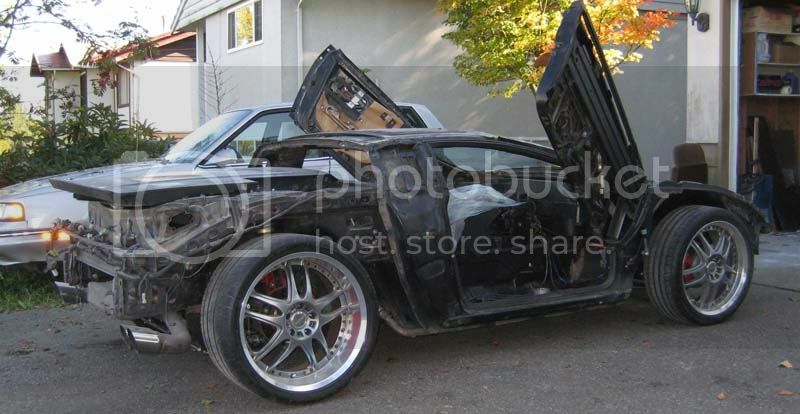 Who's Lambo door kit did you use? Over a week since the last update? Bravo and inspirational. I sit every night trying to come up with mods I can do to mine eventually. I don't suppose you will ever drive this is the rain (on purpose anyway), but what could you do for water drainage. John, you really need to add something like this to your car. Being OBD2 it would be nearly plug and play for you, except for extending the wiring to the cabin from the ECM. I love the "Fighter Jet" style huds on the market. We can get them for the Blazer and GTP, just not for my early motors. I think you would love the look of this would work really well with your "Attack" style body of the car and interior. Dang John, that is Amazing. I have this for my 857, but it might be better suited to your car. I have this for my 857, but it might be better suited to your car. Looks (and sounds) like a deleted scene from Forbidden Planet. Wow, very impressive! Who makes these sketches for you? They are awesome. Is it possible to have them sketch up my project? Car-lo does his own sketches,...he is very multi-talented ! 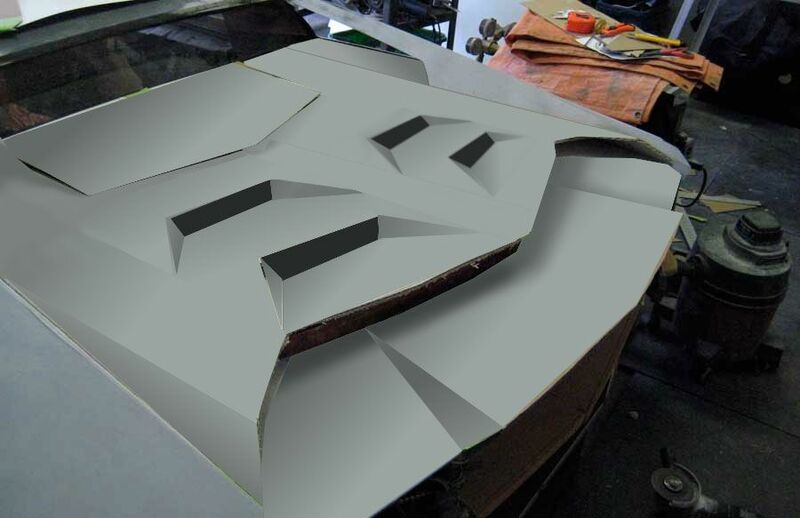 why not glass over the stock fiero hood vents .they wont be needed anyway and would look less busy .love the build and this thread . I agree, the vents should go. Like this.